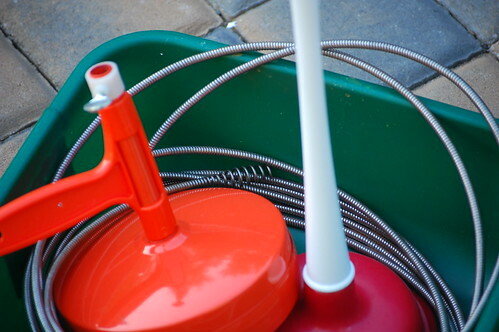 That is, a bucket, a plunger, and an auger (aka drain snake). The auger is that long grey cable with a pointy spiral at the end. The big orange thing is a reel for the auger, not really needed but it helps quite a bit with leverage. The auger+reel cost about $15 at OSH, and you can buy something similar on Amazon . I recommend buying one now, because you'll eventually run into a nasty clog. Plunger use is pretty self-explanatory. If that solves your clog, then great! If not, then you'll need to use the auger. In my case, water was backing up into our tub. In other words, stuff draining from the kitchen sink and bathroom sink ended up in the tub. This happens when there's a clog further down the line, in a pipe that's shared. The water backs up into the tub because it's the lowest basin. Plunging doesn't usually work in this case since there are too many other places for air to escape, so you can't generate the necessary air pressure. Begin by using your bucket to clear out the dirty water from the tub. That stuff is gross. You can dump it into the toilet, which should drain separately into the sewer from your other drains (note: if your toilet is backed up and plunging doesn't help, call up Joe the Plumber. It's worth the money just to avoid the nastiness). The best place to insert the auger is the upper drain of the tub, which is the round vertical metal piece on the end of the tub. Take out the screws holding it in and remove it and and anything attached to it (often a long drain stopper). You should now be able to see the pipe behind the drain which turns downwards. a. push - you push on it, and it goes in, until it stops. This gets the auger down straight lengths of drain pipe. b. rotate+push - you rotate the auger cable while pushing on the cable. This twists the end of the auger, helping to work the auger around curves in the pipes. The pressure from pushing moves it through. c. rotate+push - you also can rotate the cable to help break through tough clogs that can't simply be pushed through. If you actually do this, then you'll end up with some nasty stuff to cut off of the auger. 5. Repeat 1-4 until you're either out of cable or water is flowing properly again. To remove the auger, don't use the reel. Just pull the auger cable out, and if it gets stuck, just rotate it while pulling. Replace the drain cover. Clean off the auger by removing any gunk and washing it with soap and water (in the tub or a bucket). Dry off the auger and leave it outside to dry. A light coating of oil should help prevent rust. To get the auger cable back in the reel (wait until it's completely dry), push the cable in and rotate the reel until it catches. Then rotate some more.